This report is part of a project on voting rights in America produced by the Carnegie-Knight News21 program. 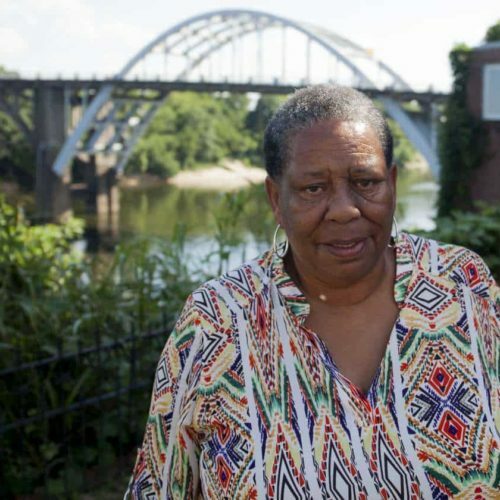 Selma, Ala. –- Joanne Bland, at age 11, marched toward the Edmund Pettus Bridge on Bloody Sunday in 1965 as hundreds of African-Americans protested, demanding the right to vote. State troopers beat her sister. Bland fainted in the clouds of tear gas. Change followed, with Congress passing the Voting Rights Act that same year. But 51 years later, a wave of new voting laws has emerged in the Southern states, potentially disenfranchising a large percentage of the roughly 3.72 million unregistered African-Americans in the region as of 2012. Nine Southern states have implemented voting restrictions since 2012. Most require voters to show state-issued photo ID at the polls. But Southern black lawmakers, activists and citizens say multiple factors have left the African-American vote at its most vulnerable, citing apathy in the post-Barack Obama era, the declining influence of former civil rights activists and the difficulty of voter mobilization. African-Americans: Shelby County attorney sues, wins challenge to Voting Rights Act from News21 on Vimeo. Nowhere in America is the debate over voting rights more symbolic than in Shelby County, Alabama. That’s where Frank “Butch” Ellis still lives on the same Columbiana farm where he grew up and in the same city where his grandfather Leven “Big Handy” Ellis served as mayor. “Big Handy” Ellis was a founding member of the States Rights Democratic Party, or the Dixiecrats, formed in 1948 to oppose the Democratic Party’s support of civil rights. Sixty-five years later, his grandson set in motion the most significant Supreme Court decision on voting rights since the civil rights era – Shelby County v. Holder. Gone is the provision of the 1965 Voting Rights Act that prevented certain states, primarily in the South, from passing voting laws without approval from the U.S. Department of Justice. The U.S. Supreme Court ruled in 2013 that the tactics used to disenfranchise voters were a relic of the past and pre-clearance no longer was necessary. “What the Supreme Court said in our case is history didn’t stop in 1965. History kept going and that Amendment 15, which is the enforcement power for discriminatory practice in voting, that it was not designed to punish for the past, but was designed to ensure a better future,” “Butch” Ellis told News21. Ellis has been Shelby County’s attorney for 52 years. Unlike many of the counties south of it and Birmingham to the west, Shelby County has no significant civil rights history. The county is and always has been predominantly white. And it continues to grow. The population increased by 65,000 people between 2000 and 2015, and is 83 percent white. Every elected official within Shelby County is a Republican. In some races, Democrats don’t run for office, leading to highly contested Republican primaries. Ellis says the Shelby County case was not meant to affect the power of minorities or civil rights. Instead, it was necessary to cease the filing of paperwork and the spending of taxpayer dollars. Ellis says the county hasn’t changed much since the Supreme Court decision, but it’s saving money and time. He says the county supports the Voting Rights Act, but Section 2 – which bans states from instituting any barriers to voting, like poll taxes or literacy tests – was its intended permanent enforcement, which still stands. In 2011, Alabama passed a statewide voter ID law that took effect in 2014 after the Shelby County decision. Opponents of the law say it was an effort to discourage the black vote. The 2012 American National Elections Study found that 13 percent of African-Americans do not have photo ID; 5 percent of white people do not have IDs. “It is no accident that a disproportionate number of those disfranchised voters are African-American and Latino. Indeed, the Photo ID Law is simply the latest chapter in Alabama’s long and brutal history of intentional racial discrimination,” the lawsuit says, estimating it will disenfranchise more than 280,000 citizens in Alabama. The number is a large jump from the 600 ballots the Legal Defense Fund said weren’t counted in the 2014 elections due to a lack of photo ID. One study published by the International Society of Political Psychology says the concerted mobilization efforts by Democrats and voting rights groups may cancel out any effect of the new ID laws. The Edmund Pettus Bridge stands in Selma. The bridge was the site of Bloody Sunday, where more than 50 people were hospitalized after they were beaten and hit with tear gas by law enforcement officers. Just two hours south of Columbiana is Selma, the birthplace of the best-known voter mobilization efforts in U.S. history. On March 7, 1965, 600 marchers tried to cross the Edmund Pettus Bridge on their way to the state Capitol to protest the death of a black voting rights activist shot and killed by an Alabama state trooper. When marchers crossed the bridge, they were met by officers who released tear gas into the crowd, and beat protesters. The event became known as Bloody Sunday. Two weeks later, Martin Luther King Jr. led another march to the state Capitol for a new law to allow blacks to vote without barriers. The Voting Rights Act was passed that summer. But Selma is a city still struggling. Its population has plummeted by about 30 percent since the Civil Rights movement, and at least 43 percent of its people live in poverty, according to U.S. Census data. 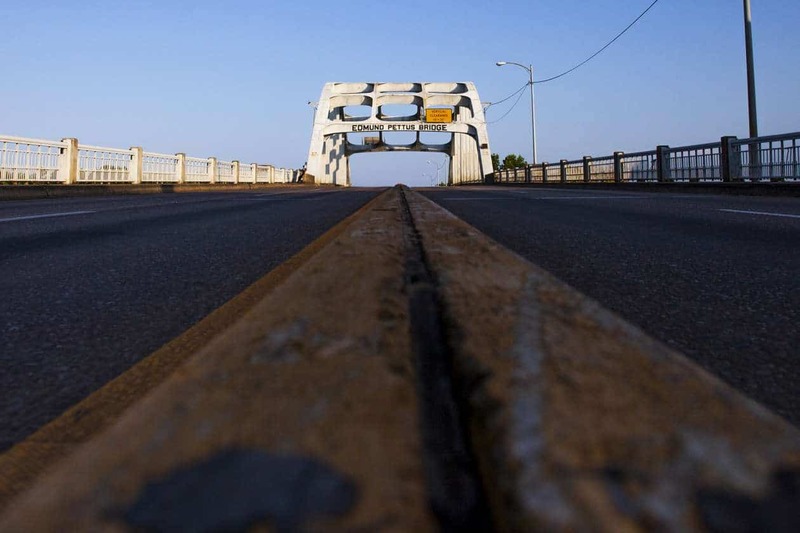 Almost all of those leaving Selma are white. Though 80 percent black, it took almost a decade after the Voting Rights Act was passed to elect a black city council member. A black mayor wasn’t elected until 2000. According to Who Leads Us, a project of the nonprofit San Francisco-based Women Donors Network, most Southern states are behind the rest of America in the diversity of elected officials. The Center for American Progress Action Fund also gave previously covered Section 5 states low marks in accessibility of the ballot. In September 2015, Alabama Gov. Robert Bentley also announced plans to close 31 driver’s license offices throughout the state. Critics said the closures would make it more difficult to get photo IDs. Less than a month later, Bentley announced services would instead be reduced to one day a month. The Alabama Law Enforcement Agency’s website shows 30 of Alabama’s 67 counties currently have one Department of Motor Vehicles office open once each month. According to U.S. Census data, counties in Alabama with the smallest number of DMV services have an average population of almost 29,000. About a quarter of them live in poverty. A third of them are black. Democratic state Sen. Hank Sanders, who represents the state’s Black Belt, introduced a bill last session that would have required each county to have at least one DMV open twice a week. It overwhelmingly passed both chambers of the state Legislature. The governor vetoed the bill, citing a lack of resources. “I think it has caused people to lose faith in government,” Sanders said. In December, the U.S. Department of Transportation opened an investigation into whether the cuts violate Title VI of the Civil Rights Act, which bans racial discrimination in state programs receiving federal support. A DOT spokesperson declined to comment on the ongoing investigation. Since then, the Alabama secretary of state’s office has been sending staff members to each county at least once a year to give free photo IDs to any citizen who needs one. Carl Nelson, who works in Selma for the Dallas County Board of Registrars office, set up a registration drive in Selma in June. No one showed up. “There are some naysayers who say these are hard times (to get an ID). They’re not. If they want to get registered, they can get registered,” he said. Tuskegee is in Macon County, deep in the rural Black Belt where 82 percent of residents are African-American. Macon was among the counties selected to have a DMV office open only once a month. Alabama overall had a 40.45 percent turnout rate in this year’s presidential primary. Macon County had a turnout of 31.25 percent – the second lowest of any county in the state. According to a 2012 Brennan Center study, more than 213,000 Alabama citizens have no vehicle access and more than 57,000 lived more than 10 miles away from the nearest state licensing office. Alabama also spends no state money on public transportation. Lowndes County is 57th out of 67 Alabama counties in per capita income. Even poorer, at 62nd of the 67 counties, is Barbour County, where the history of the South is preserved in cities like Clio and Clayton. In Clayton, a Confederate soldier memorial sits in front of the county courthouse, and in Clio, the painted image of former Gov. George Wallace, a pro-segregationist, is the centerpiece of a mural dedicated to the city’s history. Total turnout in the county in the 2012 election was 66.9 percent, below the state average of 73.2 percent. And despite the nearly 1-to-1 black-white ratio today, whites held 11 of 12 elected official positions in Barbour County in 2015, according to data from the Who Leads Us project. Registration, voter purging, redistricting and a lack of communication between elected officials and the black community remain prevalent, according to Clayton Councilman and former mayor Charles Beasley. Barbour County also has the highest purge rate of any county in the United States, according to a News21 analysis of voter purges across the country. Skeptics say voting doesn’t matter because it won’t improve the racial and economic disparities. Clayton is 63.8 percent African-American, and Clayton’s per capita income is $12,121. Sitting on his friend’s front porch, Kevin Beasley wonders why people his age would vote for anyone besides the sheriff because of the tension, both locally and nationally, between young blacks and law enforcement. Clayton’s mayor is Rebecca Beasley, who also runs the local newspaper, the Clayton Record. Her family has a history of political leadership – her husband is Billy Beasley, who is a Democratic senator in the Legislature. Her brother-in-law, Jere Beasley, served as lieutenant governor in 1972. She said the best way to increase turnout is to convince voters that if they don’t vote, they don’t have a voice. Any issues faced because of the ID law is the voter’s responsibility, she added. Cynthia Franklin, who has worked as a registrar for the Clayton-based Barbour County Commission for 15 years, says that “everything here is transparent,” and that various things affect the turnout in Clayton. Primary turnout indicates these outreach efforts might not be enough, with Democratic voter turnout in Southern states dropping by an average of 44 percent. High rates of poverty among African-Americans in these states, lack of transportation and difficulty obtaining ID may keep many away from the polls. And Alabama is still behind the rest of America in terms of ballot accessibility and representation in government, placing last in the Center for American Progress Action Fund’s rankings. Neighboring Georgia received the lowest possible mark in ballot accessibility. Located in the Black Belt of Georgia, Americus has been a battleground for voting access and representation issues since the Civil Rights era. Juanita Wilson, 68, a councilwoman for the 59 percent African-American city, experienced these conflicts in her youth, when she protested in the city streets for racial equality. She was jailed and detained in an abandoned stockade for 30 days. Today, the fight is different. She says much of her advocacy efforts go toward motivating younger black residents to go to the polls. Young black turnout in Sumter County, where Americus is located, is significantly lower than other demographic groups. Only 9.7 percent of African-Americans ages 18-29 turned out in the May primary, compared with 48 percent of blacks ages 60 and up. For whites, 27.8 percent ages 18-29 turned out, compared with 59 percent older than 60. But just a few houses down from the home where Wilson was raised on Forrest Street, 18-year-old Eddie Lusane says he is ready to vote for the first time in November. “I think if I can get a lot guys and females in my neighborhood who are about to turn 18 to come with me to vote, I can bring change,” he said. Three years after the Shelby County v. Holder decision, some in Americus say the progress of the past has diminished significantly. “(The South) is going back in terms of voting rights, and it’s going back in terms of civil rights right now,” said the Rev. Mathis Wright, the NAACP president for Sumter County. The Rev. 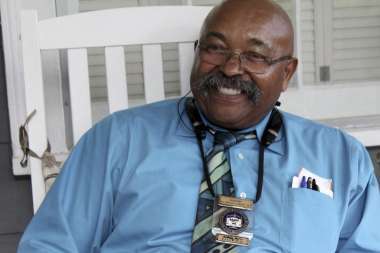 Mathis Wright is the Sumter County NAACP president and the leading plaintiff in Wright v. Sumter County. The case challenged the county’s implementation of electing two at-large members of the Sumter County Board of Education, arguing it would prevent African-Americans from being represented equally. Wright is the lead plaintiff in a case against the Sumter County Board of Elections and Registration over the county’s implementation of electing two at-large members of the Sumter County Board of Education. The change would make it more difficult for African-Americans to be elected and represented equally in the majority-black county. The school board once had a 6-3 African-American majority, but now has a 5-2 white majority. Robert Brady, the elections supervisor for Sumter County, declined to comment on the case. The debate of district changes reducing minority power is not exclusive to Americus. In Macon-Bibb County, district changes already have altered the racial makeup of the county commission. Former city councilman Henry Ficklin says this has reduced black influence in his hometown’s historically strong black community. A 3-2 black majority on the county commission in 2012 is now a 6-4 white majority due to the addition of districts when the city of Macon and Bibb County consolidated governments in 2014. “Consolidation is a Southern phenomenon that basically tries to take away the voting rights of blacks so their strength won’t be where it should be under the old system, which is the system that generally most of America has,” Ficklin said. The change also brought new district lines. Macon’s Cotton Avenue district used to be the hallmark of black success in the South. Today, it represents its new divide. One side is in District 8, represented by Virgil Watkins, who is black: the other is in District 2, represented by Larry Schlesinger, who is white. The new lines affected Ficklin directly in his race for commissioner of District 2 in 2013, which is 62 percent black, according to data from the county Board of Elections. Districts 2 and 3 split an apartment complex, but all voters from that complex were mistakenly put into District 3. The people who cast ballots in the wrong district exceeded Ficklin’s 26-vote loss in the run-off election. The Board of Elections allowed for a final redo, in which Ficklin lost again. Ficklin attributed his third loss to Schlesinger in five months to the way voting districts were redrawn by the Republican-led state Legislature, and poorer residents having trouble getting to the polls for the third vote. While the number of districts has increased, the number of voting precincts has dropped from 40 to 33 in the county. Six of those seven precincts voted overwhelmingly for President Barack Obama in 2012. Efficiency and cost cutting is the main reason for polling place consolidation, according to Macon-Bibb County Elections Officer Tom Gillon. He said when the city and county merged, both had to reduce their total number of employees. Poll workers were among the first positions cut, meaning several precincts wouldn’t be properly staffed. “If we had enough money, we’d go up to 50 (precincts) if we wanted,” he said. In the traditionally black stronghold of Durham, North Carolina, the Legislature’s efforts to implement an extensive voter ID law and political apathy among young African-Americans have voting rights advocates worried about the strength of the city’s political future. “Durham’s a progressive town in what used to be a pretty progressive state, and just recently we’ve noticed how much our values are being challenged at the statewide level,” said Kate Fellman, director of You Can Vote, a voter registration coalition based in North Carolina. 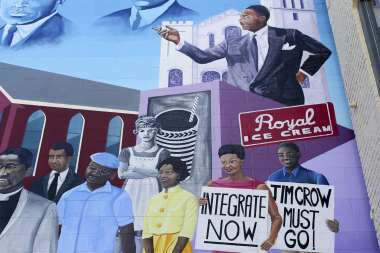 A civil rights mural in downtown Durham, North Carolina, commemorates various civil rights moments in Durham’s history, including a sit-in at the Royal Ice Cream parlor and the integration of its public schools. Community funding helped push the creation of the mural in 2015. African-Americans: Voting restrictions in Durham, N.C. from News21 on Vimeo. You Can Vote is one of the many voter advocacy groups in the state opposed to House Bill 589, often referring to it as the monster voting law. It required voters to present acceptable photo ID, cuts a week off the early voting period and eliminates same-day registration and out-of-precinct voting. An amendment to the bill in 2015 allowed voters with a reasonable impediment to getting photo ID to cast a provisional ballot. “We cannot ignore the record evidence that, because of race, the legislature enacted one of the largest restrictions of the franchise in modern North Carolina history,” Judge Diana Gribbon Motz wrote in the ruling. State Republicans have said they will appeal the law and seek other possibilities to keep it in effect in November. Critics of the bill say the law discriminates against minorities, college students and the poor, saying these groups are less likely to have photo ID, a consistent home address or the means to learn the proper election procedures. According to court documents, African-Americans cast 34 percent of photo-ID-related provisional ballots that were not counted in the state’s March primary and made up 23 percent of registered voters in the primary. The data exclude any voter whose race was undesignated. Gunther Peck, a public policy professor at Duke University who leads teach-ins on voting, said the law unintentionally might affect everyone, including Republicans. Voters on both sides are typically for voter ID, according to a 2013 Elon University poll. Ninety-three percent of Republicans and 52 percent of Democrats polled were for it. Whether or not the bill in its current form lives to see the presidential election, its effect was tested in the primary. State Board of Elections Executive Director Kim Strach said in a statement that “comprehensive voting station guides” were put in place in the primary so every voter knew what options they had. The statement also said 99.5 percent of voters brought proper ID. The law’s other implementations would be a bigger factor, with same-day registration during early voting and out-of-precinct voting on Election Day, allowing more than 29,000 people to vote in the primaries, according to a Democracy North Carolina analysis. Neither voting method will be available in November if the law is in place. With North Carolina being a closely contested state the past few election cycles, any sort of voter apathy or suppression could have big ramifications, according to Peck. “This law could compromise the integrity of the vote,” he said. “The stakes are pretty dire. And it doesn’t matter who wins. Here, it’s about the integrity of our democratic process.